My name is Devrim, I am Turkish, and I live and work around a farm. I have recently started "collecting" bees that have swarmed on our land, and I've been so successful, I've had to develop a way to make a bee hive "fit for a queen" in a little time. At the moment I have 12 hives, and lot of honey ! It might not be the best way to make a hive, but its very simple to make and you can build one in only a couple of hours. Only very basic wood working tools are needed. 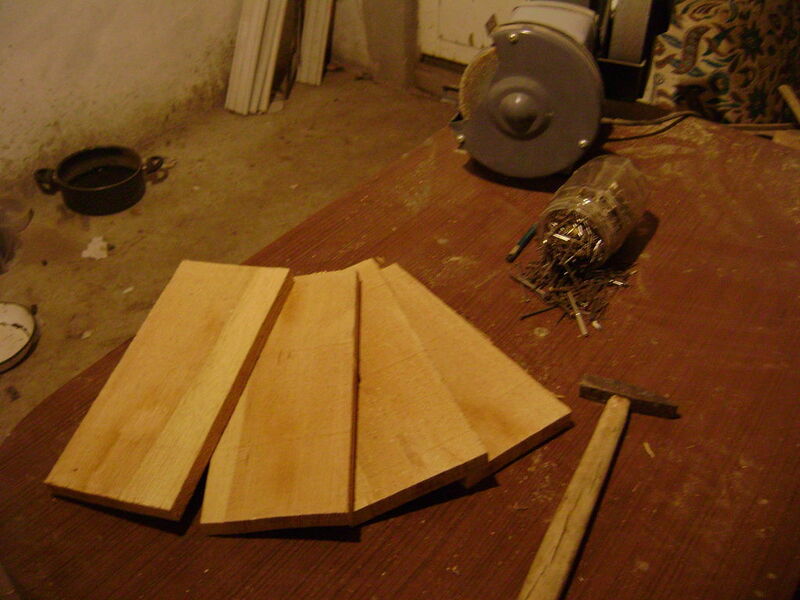 A jigsaw, a drill are useful, some drill bits, a chisel - no major wood shop ! As you can see from the intro picture, the hive is very simple. It consists of a simple wooden box, made of clean pine wood. Inside that we hang the comb frames., and on top of the roof I will form a simple piece of tinplate, or better, galvanised sheet into a durable roof. Because it houses bees we will use NO preservatives of any kind on the wood, so the metal roof is a vital anti-rot feature. You can use any metal - I had some galvanised sheet, you could use aluminium flashing or possibly even copper. Step 3: The Roof ! The roof has two stops on it to locate it on the hive, and then covered with metal. Here you can see me clamping the metal to the wood, and beating the edges up. I secure the metal with a couple of nails. The roof extends ~50mm over each edge of the hive, as you can see in the pictures, so that rain drips clear of the walls. The bees will live and work over the comb frames. The frames are made from wood, about 35 mm x 10 mm and just nailed together. We'll add some metal wire as bracing, and support for the honeycomb foundation. (HCF), the yellow sheets. The frames are about 300 x 150 mm (12"x 6"), and the TOP piece is roughly 25 mm longer, so that when you set it on, 12mm hangs over each end. The top is ALSO about 20mm wider than the rest of the frame. This lets the comb hang in the box, with no chance of it touching the other combs. Combs need good ventilation. I use very simple joinery, there is no need for anything complicated, the box is just a simple housing joint. The only important thing is the rebate for the combframes on two sides, which I made with a chisel, but you could route or saw directly if you want . It may not be the "best" design, but it works great ! Sorry for late answer. I can't sit quiet in theese days because of my works. The yellow material is fabricated especcially for combs. But, it is not that important. Bees can make their own houses. Only give them their house and combs. They do the work best. And, if you are going to make bees only for eat the honey, don't use them. So is much better. Hi Mr. Lemonie; Thanks for your comment and visit. If you are thinking to let your bee family for some years in a hive like mine, you are right. But, I planned and made this hive for to take a very small new bee family to safe. Let's look for some years: Bees doesn't make swarms in every season of the year. For example here, you can see this action at tha second half of april. If you broke mother boxes(?) in the hive, they couldn't make new swarms. To make a second floor isn't difficult too. Many Greetings. Yes Jayefuu. Queen Cells. I'll take much of photos for you in april. Don't worry about the dead hives. In USA there is like a 40-60 % death rate among professional beekeepers right now so your in good company. I really miss having a bee hive to look after. I used to help an elderly friend with his. Definitely on my list of things to build. This is a very nice instructable. I have a question. How large are the holes for the bees? It's a good Idea to make them adjustable so that if your hive is week at some point and there is a stronger hive somewhere near, your hive will have an easier time defending against intrudes. very nice instructable i like very much..keep it up. Thank you for nice comment. This gives me power. The hive is not that good but, it makes the work very well. Now, here in Turkeyş, we are living the winter and bee families become smaller in the winter time. This small boxes are also good for winter time. The family can keep warm them easily. Where do you get the honeycomb foundation???? This is very good, but is it big enough? Your swarm may leave when it is larger, so do you plan to add more boxes? Hi Seolfor: Thanks for comment. I open holes for bees with my chisel. I think, it is not very important how large. They have to be large enough for a bee. But, most of other visitors like little mouses mustn't have way in.